This rather large bottle came in the goody bag I received when I attended the Bristol Bloggers meetup. My arms and shoulders paid the price for carrying this around for a couple of hours while we went shopping! Different goody bags contained different fragrances but I received mango. I was pleased with this as I’m a big mango fan but the other fragrances do also sound amazing. Georgina from Makeup-pixie3 received the Vanilla Biscuit one in her goody bag and has just published her thoughts on this here. Hmm, I’m not entirely sure what to think about this! Anyway…I decided to have a bath the other night and thought I would give this a try. I started running the bath and then thought, actually is this a bubble bath? 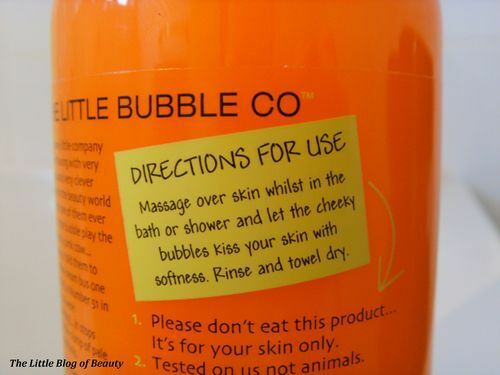 It says it’s a bath gel but the instructions say to massage over skin whilst in the bath or shower. So I was a little confused but thought what the hell just go for it and give it a try. 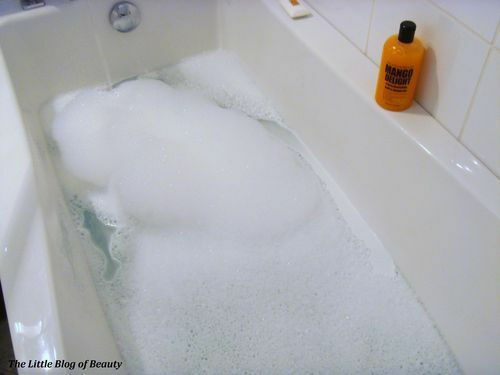 As the bubble snap shows, even if this is not intended as an actual bubble bath it doesn’t do too bad on the bubbles producing front. Once in the bath I then used this to wash as well using one of those thingy’s, I have no idea what you call them (the pink thing in the background on the first picture!). This has a lovely mango fragrance and it lathers up well. Apart from that there’s not a lot more to say about this. At just £2.99 for a 500ml bottle this is a nice little bargain product that can be used in the shower or as a bubble bath. Oh and it’s also not tested on animals (which is now a given for products sold in the EU as of the 11th March 2013), suitable for vegetarians, allergen free and contains no parabens. 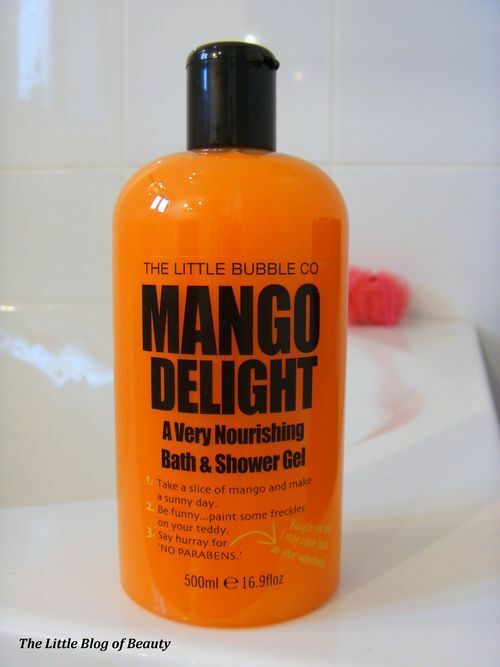 The Little Bubble Co bath and shower gels are available from Boots.